This Day in North Carolina History was launched on WordPress on October 1, 2013. At the time we had no idea how long we would be able to continue to find fresh content for each day. As time passed it got harder and harder to find new topics, so the decision was made to put the emails into re-run on October 1, 2016. With that change comes the opportunity to move all of the old posts into a new platform that will be more attractive and, most importantly, easier to search. Links that you have on websites will continue to function as they always have. The site will just look and operate differently. Daily updates from This Day in North Carolina History will continue uninterrupted for most users. The only users that will experience an interruption are those following the blog through their WordPress account. If you are doing so and wish to continue to receive updates, please sign up with your email address here. We hope that you will take the time to fill out this short form in order to continue to “get history in your inbox.” After all, re-runs are history, too. Buckminster Fuller (far left) with colleagues at Black Mountain College. On February 23, 1983, Buckminster Fuller was awarded the Presidential Medal of Freedom, the nation’s highest civilian award, for his contributions as a geometrician, educator and architect-designer. 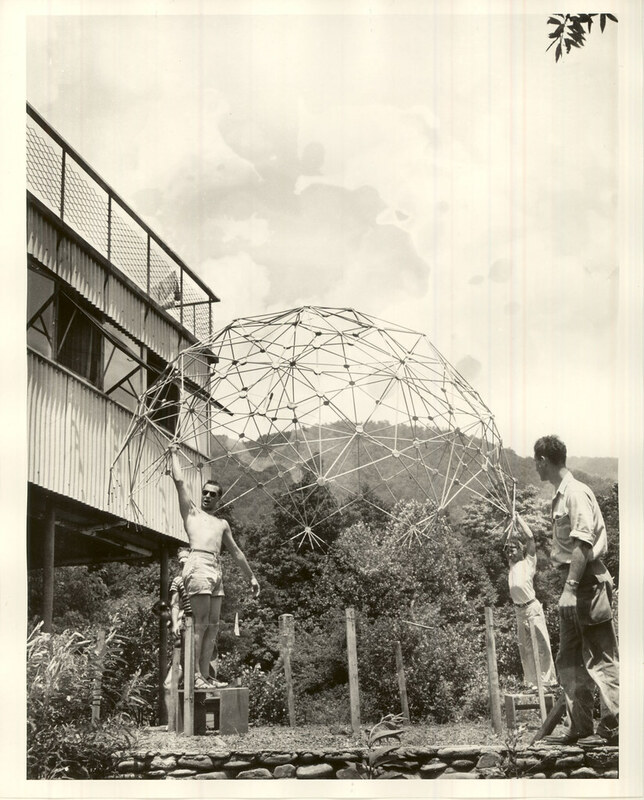 A geodesic dome at Black Mountain College. As a guest lecturer at the North Carolina State University School of Architecture from 1949 to1955, Fuller worked with his students to design uses of the geodesic dome for a cotton mill, military installations and the Ford Motor Company. He patented the structure in 1954. Fuller received an honorary Doctor of Design degree from N.C. State in 1954. After leaving academia, Fuller served as president of the Raleigh architecture firm Synergetics from 1955 to 1959, where colleagues and students created sustainable commercial domes. The Buckminster Fuller Institute has now identified more than 300,000 geodesic domes around the world, ranging from shelters to radar stations to playground structures. On February 21, 1933, Nina Simone, often called the “high priestess of soul,” was born in the small town of Tryon in Polk County. Determined to become one of the first highly-successful African-American concert pianists, Simone spent a summer at the famed Julliard School after graduating high school in Asheville in 1950. Denied admission to music school in Philadelphia, Simone took menial jobs there. While on a trip to Atlantic City, N.J. in the summer of 1954, Simone began to experiment with popular music. Word of her talent spread, and she became in high demand at nightclubs all along the Mid-Atlantic coast. After releasing her first album, Little Girl Blue, in 1958, her work began to reflect her increasing involvement in the civil rights movement and her close associations with leading African-American intellectuals like Lorraine Hansberry and Langston Hughes. After releasing 13 albums during the 1960s, Simone hit a rough patch in the 1970s, struggling with a divorce and mental illness. She toured extensively in Europe during the 1980s and her career began to wind down in the early 1990s. She died in France in 2003. On February 20, 1948, Piedmont Airlines launched its first passenger flight. The flight took off from Wilmington and arrived in Cincinnati after making several stops. Piedmont Airlines’ roots stretch back to 1940, when a struggling aviation company called the Camel City Flying Service was reincorporated by Thomas H. Davis as Piedmont Aviation. Piedmont Aviation’s initial focus was training pilots and flight instructors to meet the needs of America’s involvement in World War II, but as that conflict wound down the company sought to change its focus to passenger service. After problems over a contract, Piedmont Airlines took the federal government’s airline regulator—the Civil Aeronautics Board—to court. The case rose to the level of the U.S. Supreme Court and eventually ended in the airline’s favor, allowing the first commercial flight to go forward. The airline grew steadily, and acquired a unique reputation for simultaneously having excellent customer service and bare-bones airplanes and other equipment. Piedmont Airlines was sold to U.S. Airways in 1989. On February 19, 1925, the North Carolina House defeated the Poole anti-evolution resolution. The resolution, introduced by D. Scott Poole of Hoke County, proposed that it was harmful to the welfare of the citizens for “Darwinism or any other evolutionary hypotheses” to be taught in the schools. In January 1924, Governor Cameron Morrison denounced two high school textbooks for their inclusion of evolution. Poole’s resolution sought to keep all such lessons out of the state’s classrooms. William Louis Poteat, a former biology professor, president of Wake Forest College and a devout Baptist, believed that evolution demonstrated the “divine method of creation.” He became one of the outspoken advocates for keeping it in the curriculum. Although the House appeared to be quite divided on the issue, when it was put to a vote, the resolution was defeated by the comfortable margin of 67 to 46. The evolution debate received national attention just a few months later during the Tennessee case that has come to be known as the Scopes “Monkey Trial.” The case was in response to a Tennessee law that was similar to the one that was defeated in North Carolina. A great overview of the evolution debate in the 1920s in North Carolina from UNC Libraries. On February 17, 1963, American basketball superstar Michael Jeffrey Jordan was born in Brooklyn, New York. Before his first birthday, Jordan’s parents moved to Wilmington, where he played three sports at Laney High School and was named to the McDonald’s All-American team. As a UNC-Chapel Hill freshman, Jordan scored the winning basket in the 1982 NCAA title game. In 1984, he was named College Player of the Year and won the first of two Olympic gold medals (the other was in 1992) with the U.S. men’s basketball team. After his junior year at Carolina, Jordan entered the NBA draft and was picked by the Chicago Bulls. His high-scoring, high-flying antics quickly made “Air Jordan” an international sports celebrity and marketing marvel. After leading the Bulls to three consecutive NBA championships, Jordan unexpectedly retired in 1993 to pursue a career in baseball. He rejoined the Bulls in 1995 and led them to three more NBA titles before retiring again in 1999. After a two-year hiatus, Jordan returned to basketball, playing with the Washington Wizards. He retired for the final time in 2003. Now the primary owner of the Charlotte Bobcats, Jordan is still widely regarded as the best basketball player of all time. The dedication of the Lincoln Memorial in 1922. Image from the Smithsonian Institution. On February 16, 1924, Henry Bacon, Jr., architect and designer of the Lincoln Memorial in Washington, D.C., died. Born in Illinois in 1866, Bacon moved with his family to Brunswick County in 1876 and then to Wilmington. He attended school in Boston and Wilmington and went on to study at the University of Illinois for a year before moving to Boston to join the architectural firm of Chamberlain and Whidden as a draftsman. He progressed quickly from there, winning awards and joining New York’s prestigious firm of McKim, Mead and White. He studied in Europe during various periods and eventually would partner with James Brite for a time. Bacon won the commission for the Lincoln Memorial design in 1912 and oversaw its completion. During the next ten years he, somewhat ironically, also served as designer and architect of two of North Carolina’s most well-known Confederate monuments: Raleigh’s Monument to the Women of the Confederacy and Wilmington’s Confederate Monument, working alongside sculptor Francis Herman Packer on that project. His own grave marker was created from drawings found in his desk following his death in 1924. He kept close connections to the Wilmington area throughout his life and is buried in the family plot in the city’s Oakdale Cemetery.